Sometimes, you don't even have to look up to see the sky. Photo taken January 4th, 2008, Worthington, Ohio. For more Sky Watch Images, go here. Beautiful. I love moon shadows. Great - I love this! Spectacular shot. I love shadows. These are like none I have ever seen. I love this version of your tree! So.. different! Great job! That's a magnificent photo, I am impressed. I love these kind of views. Wow...amazing shadows. Great choice for SWF! Tom: Really nice capture, I noticed the same thing last night on our snow cover. 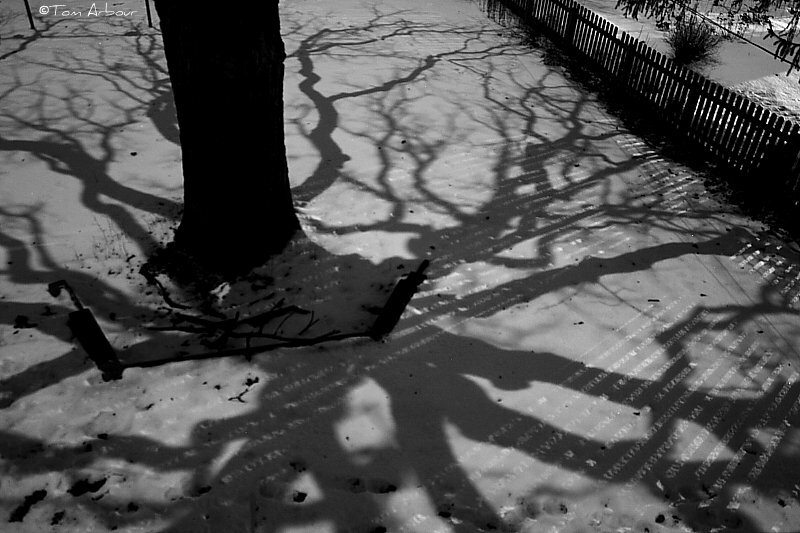 It's true that a great shadow can create a mental image of what the eye isn't seeing. it is like letters are written on the ground - intriguing pic - glad I found you! Wonderful use of light and shadows.